I’m taking a turn on MBA Mondays today. We are moving past the concepts of interest and time value of money and moving into the world of corporations. Today, I’d like to talk about what kinds of entities you might encounter in the world of business. First off, you don’t have to incorporate to be in business. There are many people who run a business and don’t incorporate. A good example of this are many of the sellers on Etsy. They make things, sell them, receive the income, and pay the taxes as part of their personal returns. But there are three big reasons you’ll want to consider incorporating; liability, taxes, and investment. And the kind of corporate entity you create depends on where you want to come out on all three of those factors. I’d like to say at this point that I am not a lawyer or a tax advisor and that if you are planning on incorporating, I would recommend consulting both before making any decisions. I hope that we’ll get both lawyers and tax advisors commenting on this post and adding to the discussion of these issues. I’ll also say that this post is entirely based on US law and that it does not attempt to discuss international law. With that said, here goes. When you start a business, it is important to recognize that it will eventually be something entirely different than you. You won’t own all of it. You won’t want to be liable for everything that the company does. And you won’t want to pay taxes on its profits. Creating a company is implicitly recognizing those things. It is putting a buffer between you and the business in some important ways. Let’s talk first about liability. When you create a company, you can limit your liability for actions of the corporation. Those actions can be for things like bills (called accounts payable in accounting parlance), promises made (like services to be rendered), and lawsuits. This is an incredibly important concept and the reason that most lawyers advise their clients to incorporate as soon as possible. You don’t want to put yourself and your family at personal risk for the activities you undertake in your business. It’s not prudent or expected in our society. Taxes are the next thing most people think about when incorporating. There are two basic kinds of corporate entities for taxes; “flow through entities” and “tax paying entities.” Here is the difference. Flow through corporate entities don’t pay taxes, they pass the income (and tax paying obligation) through to the owners of the business. Tax paying entities pay the taxes at the corporate level and the owners have no obligation for the taxes owed. Your neighborhood restaurant is probably a “flow through entity.” Google is a tax paying entity. When you buy 100 shares of Google, you are not going to get a tax bill for your share of their earnings at the end of the year. And then there is investment/ownership. Even before we talk about investment, there is the issue of business partners. Let’s say you want to split the ownership of your business 50/50 with someone else. You have to incorporate to create the entity that you can co-own. And when you want to take investment, you’ll need to have a corporate entity that can issue shares or membership interests in return for the capital that others invest in your business. So now that we’ve talked about the three major considerations, let’s talk about the different kinds of entities you will come across. As the business grows and takes on more sophisticated investors (like venture funds), it will most often convert into something called a C Corporation. Most of the companies you would buy stock in on the public markets (Google, Apple, GE, etc) are C Corporations. Most venture backed companies are C Corporations. 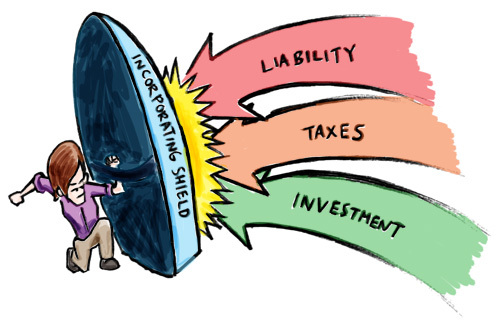 C Corporations provide the limitation of liability, provide even more sophisticated ways to split ownership and raise capital, and most importantly are “tax paying entities.” Once you convert from a LLC to a C corporation, you as the founder or owner no longer are responsible for paying the taxes on your share of the income. The company pays those taxes at the corporate level. There are many reasons why a venture fund or other “sophisticated investors” prefer to invest in a C corporation over a LLC. Most venture funds require conversion when they invest. The flow through of taxes in the LLC can cause venture funds and their investors all sorts of tax issues. This is particularly true of venture funds with foreign investors. And the governance and ownership structures of an LLC are not nearly as developed as a C corporation. This stuff can get really complicated quickly, but the important thing to know is that when your business is small and “closely held” a LLC works well. When it gets bigger and the ownership gets more complicated, you’ll want to move to a C corporation. A nice hybrid between the C corporation and the LLC is the S corporation. It requires a simpler ownership structure, basically one class of stock and less than 100 shareholders. It is a “flow through entity” and is simple to set up. You cannot do as much with the ownership structure with an S corporation as you can with a LLC so if you plan to stay a flow through entity for a long period of time and raise significant capital, an LLC is probably better. Another entity you might come across is the Limited Partnership. The funds our firm manages are Limited Partnerships. And some big companies, like Bloomberg LP, are limited partnerships. The key differences between a Limited Partnership and LLCs and C corporations are around liabilities. In the limited partnership, the investors have limited liability (like a LLC or C corporation) but the managers (called General Partners) do not. Limited Partnerships are set up to take in outside investment and split ownership. And they are flow through entities. There are many other forms of corporate ownership but these three are among the most common and show how the three big issues of liability, ownership, and taxes are handled differently in each. The important thing to remember about all of this is that if you are starting a business, you should create a corporate entity to manage the risk and protect you and your family from it. You should start with something simple and evolve it as the business needs grow and develop. As an investor, you should make sure you know what kind of corporation you are investing in, you should know what kind of liability you are exposing yourself to, and what the tax obligations will be as a result. And most of all, get a good lawyer and tax advisor. Though they are expensive, over time the best ones are worth their weight in gold. A lot of the comments have pointed out the complexity of converting LLCs to C-corps, as well as dealing with things like option pools, etc. I think the important thing is to view all three as tools in a toolbox and pick the right one. In my mind, I’d still do a S-corp for a new startup any day of the week and convert to C-corp when it was time. Done it several times, and it was quick, easy and cheap. I’ve done several LLCs, and here is what they are really good at: housing joint ventures that are owned by existing companies. The C-corp I’m involved in created a joint venture with another C-corp. Rather than create a tax-paying entity for the joint venture, it was easy as pie to make the joint venture a LLC with flow-through to the two C-corps. As a reminder, the reason you can’t do this with a S-corp is because a S-corp can’t have any of its shares owned by a non-individual. The LLC is how you get a flow-through entity that can be owned by corporations. S Corps limit liability as effectively as C.
So if you’re planning to build a profitable company without complicated financing then an S really is a very viable option. Lets say you and two buddies are going to build iPhone apps. That being said if you take on VC it won’t work. They can’t get Preferred Shares (which they need) and passing through the profits is a painful from an accounting standpoint. Going from a S to a C is very easy (done it twice), going from a C to an S is tough because if you sell within ten years of conversion you have to pay the “built in gains tax” it would take several pages to discuss what that is but its acronym says it all BIG. This post was originally written by Fred Wilson on February 22, 2010 here.